A TWO-goal opening round loss is never a good way to start a season, but United Warriors veteran Sam Hill could see the positives shortly after full-time. Two goals in the last half hour handed Bargara a 4-2 win at Hervey Bay Sports Club, a result the puts United alongside KSS Jets and Sunbury at the bottom of the Wide Bay Premier League table. But Hill, who played his first competition game since he suffered a serious knee injury during the 2016 grand final, said he knew where his side needed to improve before the Warriors host Sunbury on April 21. "We're definitely a work in progress," Hill said. "It was a good hit-out, it let us know where we're at. "We've got the ball movement there, but we need to work on accuracy and knowing more players. Previously we were together for five or six years and knew what each other was doing. We're a mix of the youth coming through playing with older guys who play a bit different, so it's getting used to seeing how everyone plays." 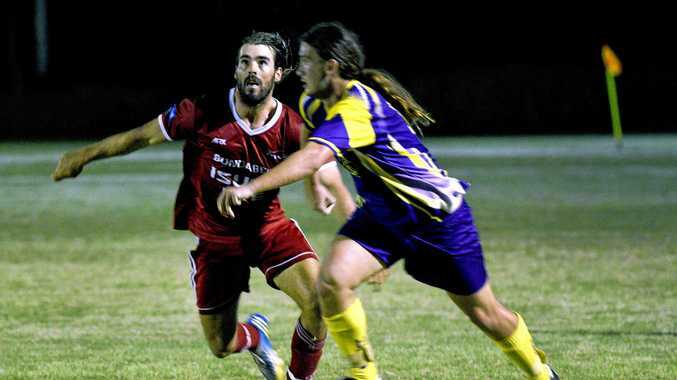 The loss of several players to Football Queensland Premier League side Wide Bay Buccaneers has not helped, as the centrepiece of the club's backline last year, Blake Walker, donned the blue and red of Wide Bay. "It's probably more inexperience, we need someone in the backline to step up and communicate like a leader," Hill said. "We lost Blake Walker who was good for that. We're also playing a different formation, all three defenders have to mark up." For Bargara goalkeeper Justin Anderson, it was the perfect return for an early road trip to Hervey Bay. "The first away game in the first round is always hard but it's all about the three points," he said. "We had a lot of second division players step up. "To get to half time at 0-0 is a good thing, especially when you're travelling." Bargara host Sunbury at Martens Oval on Saturday, while United have the bye. Wilks he or won't Ben finally play for Wide Bay?